As a side note, I am impressed with the idea of the Silver Alert. For those who have not seen one before. The only downside is that they did not set a valid lat and long. Well it is valid... It just does not have the effect they expected. They have set both lat and long to zero which puts the warning in the South Atlantic Ocean. I am not sure about you, but I rarely have cause to look down there. I do hope they find what they are looking for and if I get some spare time during daylight hours I will give someone up there a call and point out the effect of zero lat and zero long. 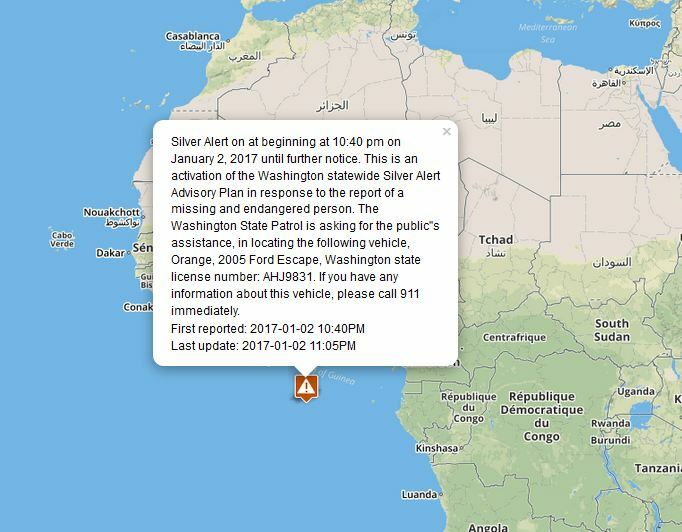 "Silver Alert on at beginning at 10:40 pm on January 2, 2017 until further notice. This is an activation of the Washington statewide Silver Alert Advisory Plan in response to the report of a missing and endangered person. The Washington State Patrol is asking for the public"s assistance, in locating the following vehicle, Orange, 2005 Ford Escape, Washington state license number: AHJ9831. If you have any information about this vehicle, please call 911 immediately. "